Can I get heated seats? Do I have to get a sunroof? 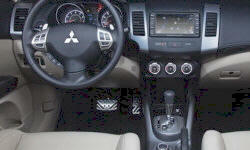 Find out what you need to know about Mitsubishi features right here. Cargo organizerAbove floor system for organizing cargo. Above floor system for organizing cargo. Active front differentialShifts power to the outside wheel in turns to counteract understeer. Shifts power to the outside wheel in turns to counteract understeer. Steering-wheel-mounted transmission controlsPaddles or buttons that can be used to manually shift the transmission. Only listed when optional or not always included with an automatic transmission. Paddles or buttons that can be used to manually shift the transmission. Only listed when optional or not always included with an automatic transmission. Partial leather seating sufacesEither only the front seats are leather or the upholstery is a mix of cloth and leather. Either only the front seats are leather or the upholstery is a mix of cloth and leather.